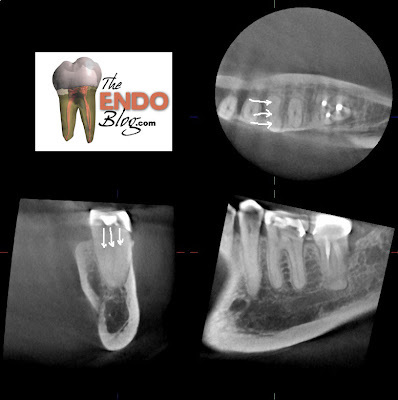 At Superstition Springs Endodontics, the use of cone beam computed tomography (CBCT) is a valuable tool in endodontic diagnosis and treatment. This technology is used on a case by case basis, following the guidelines specified in the joint position statement by the AAE and AAOMR. The joint position statement by the AAE and AAOMR regarding the use of CBCT in endodontics states that "The patient’s history and clinical examination must justify the use of CBCT by demonstrating that the benefits to the patient outweigh the potential risks. Clinicians should use CBCT only when the need for imaging cannot be answered adequately by lower dose conventional dental radiography or alternate imaging modalities." A significant concern noted in this position statement is the added radiation dosage to the patient. In our practice, using the J. Morita Veraviewepocs 3De, the patient is exposed to the lowest radiation dose on the market. A single 40 x 40mm 3D scan exposes the patient to 0.029mSv. 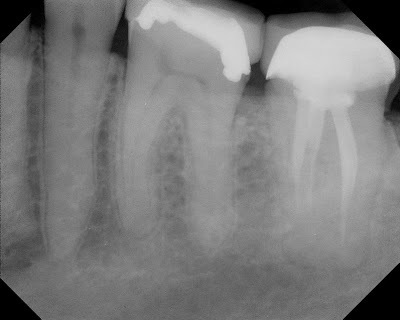 This is approximately the same amount of radiation a patient would receive with 9 digital periapical films (0.003mSv). The volume of data acquired in a single scan allows us to look at that tooth from any coronal, sagittal or axial view, and the ability to re-slice the volume at any slice thickness. This volume of data can be manipulated over and over to gather unlimited amount of information about the tooth and it's periapical tissues. A CBCT scan, provides visualization of root number & anatomy, canal number & morphology, much more accurate evaluation of peripical tissues. Understanding the advantages of CBCT, the limited radiation and limited liability associated with a focus field CBCT, I would suggest that the benefits routinely outweigh the potential risks. Unfortunately, there are often benefits of a CBCT scan that are not apparent unless the scan is taken. The following case is an example. This patient presented with complaint of pain in lower left quadrant. Recent crown prep on #19. Regular diagnostics were inconclusive as to the source of this pain (#19 was testing normally to vitality, probing and percussion testing) A short obturation of #18 was noted, but this tooth was asymptomatic. After short period of time waiting to see if symptoms localized, and failure to do so, a CBCT scan was acquired to evaluate if there was apical bone loss associated with one of these teeth that would help in the diagnosis. CBCT did not show any radiographic lesions on #18 or #19. The temporary crown #19 was removed for additional pulpal testing. Tooth #19 gave no response to cold on the buccal side and a vital response on the lingual side. 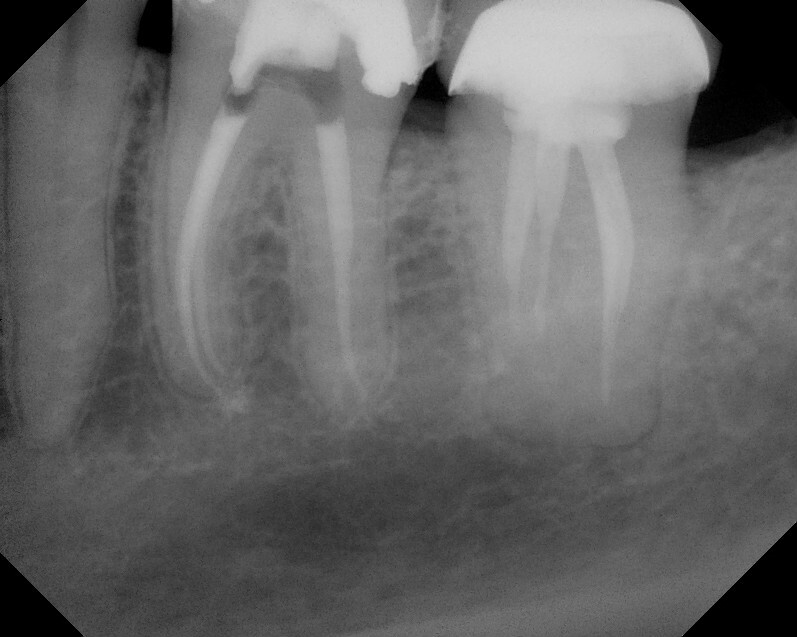 It was decided that endodontic treatment should be initiated on #19 with a probable "partially necrotic" pulp. The CBCT gives us valuable information about tooth #19. For example, following CBCT, prior to starting RCT #19, we know that the mesial root is a single root with 3 canals that merge. We also know that distal root has a single canal. 3 canals found in a single, mesial root. This was identified prior to treatment with CBCT. In this particular case, the 3rd (middle) canal would likely not have been found due to its location. In this case, the CBCT identified a variation in the mesial canal morphology. Knowing that the mesial root was a single root and that it had 3 canals, gave me the ability & confidence to explore the ML-MB groove to a greater depth than would have normally been done for fear of perforation. This is a perfect example of radiographic information that is not available through traditional 2D imaging. This information allowed us to provide better cleaning, shaping and obturation, which will lead to a better RCT. Excellent evaluation! I just found your blog and I'm lucky to have found such interesting read. Very interesting and informative blog post. Enjoyed reading it! I enjoy your blog a lot; however, I assume every lower molar has a mid-mesial canal until proven otherwise by cleaning/drilling the isthmus between MB and ML with a very small round bur. Under magnification, perforations should not happen. Location of a mid-mesial should not be necessary with a CT scan. Fantastic blog and great evaluation! The 3D pictures will make the process more perfect and successful as the visual appearance of the tooth root will be more prominent. Thanks for the observation. I think 3D technology is very much supportive for dentistry as it gives more perfection to each and every treatment. Some modern dentistry like all on 4 Green Bay, dental implants Sun City seem to use 3D techniques for dental treatment. They are having big success. Your post is pretty useful for the dental community. Thanks for taking the time and effort. Endodontic Retreatment - Another Tooth Saved!